Additionally, the client is requesting tagging of the spaces that includes photos and videos that popup. What solution are you using to scan super-large spaces? And, is tagging photos, videos and other digital assets possible? P.S. What other questions would you like me to ask the Forum Member that would be helpful in recommending a solution? 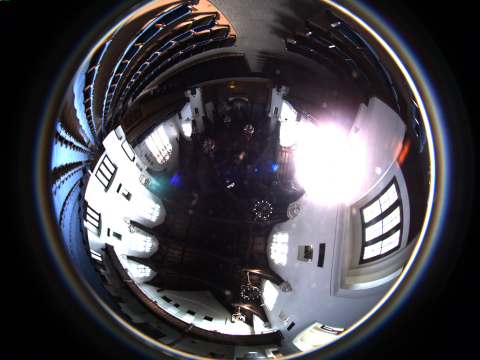 I am not totally sure, but I think that a combination of spherical photos taken with any decent 360 camera (IRIS360 and above) together with Kolor software (Panotour Pro) should do the trick. For what I read, you can insert links, images and videos to Panotour. To be honest, I only have used Panotour Pro for simple projects in golf courses where my main challenge was to align 200 panos along the 18 holes and create a VR compatible tour. I have never tried to insert images and or videos, so I cannot assist in the technical aspect, but perhaps someone else with actual experience can add useful info. It is difficult to respond without knowing the customer requirements. Are they looking for only a 3D Tour with panoramic imagery? 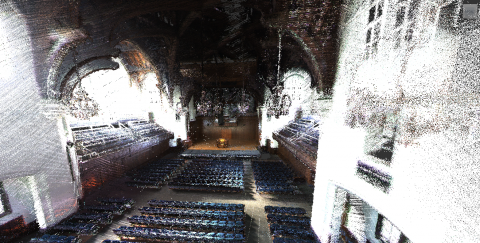 Do they need a point cloud with a specific accuracy? Do they need both? If they require just a 3D Tour, Realvision and iGuide are great options because of their speed of acquisition and they do not have limitation on size of space. And their panoramic quality is great. If looking for both a 3D Tour and an accurate point cloud, you are really looking at high-end hardware from Faro, Leica, etc. The Leica BLK360 referenced by Dan looks promising, but I haven't seen any sample data yet and it isn't available until spring 2017. If you need just an accurate point cloud, you can still use the high-end devices I mentioned above, but you should also check out Paracosm (www.paracosm.io), GeoSlam (www.geoslam.com), and Kaarta (www.kaarta.com ... formerly Real Earth). I have not reviewed their data yet, but they present some promising solutions for fast data capture compared to terrestrial systems. Thanx for posting it on the forum. I do not know yet what the client wants to use it for. As soon as they answer my mail follow-up on this topic, I will let you know. Dividing the space into multiple spaces would be something I could suggest. They said that is what they are looking for, but additionally, they would like the option of including photos and videos. Thank you for the recommendation of alternatives for this project. Large industrial spaces are also an excellent opportunity to wear my hardhat. This is definitely a scenario where iGuide shines as an automated turn key system that can handle large spaces with an automatically generated floorplan that is cost effective and efficient. Matterport would be cool . We all live the ui and the dollhouse and floorplan... But yikes. This is where matterport definitely flounders. If you can get it in under 350 scans or multiple tours, good job. Glad that @Chris_iguide chimed in. Any thoughts on an industrial theme for iGuide? The tabs system might not be needed. Plus, depending on the needs of the client, @Metroplex360 offers a service - MP2VR - to convert and publish the iGuide to Google Street View. However, iGuide really shines when you access the video and the still photos from the menu bar to tell the whole story. 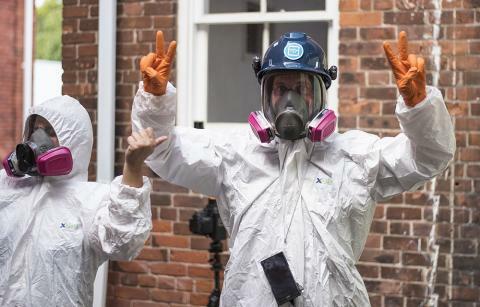 @Chris_iGuide, with that outfit you are ready for "Breaking Bad II - The canadian connection"
By the way, how is winter treating you guys there at Waterloo? I used to live there for a brief period of time. Very nice place! @jfantin, It's been rainy and warm for all of January! I'm not complaining but I do miss the sun. You that Mexico already has its own Breaking Bad, right? I totally need to watch it and you just reminded me!!! Sr. Blanco. Thanks to @PCollert for the earlier shout out to Kaarta. We have developed real-time, interactive, mobile mapping systems that allow you to move rapidly and fairly aggressively through small and large spaces. Examples are posted here which are of a 300,000 sq ft facility that is currently under construction. The scan was done in under 90 mins and there was no post-processing - only about an hour for visualization. The map can be seen as you walk the facility. You can see the map being built as you walk. We do not have colorization at this time but plan to launch that later this year. We are also preparing a new handheld product that is completely self-contained called the Contour. See our website at www.kaarta.com for more details. Thanks. Can you share a link to the model that you included a screen grab? P.S. You might find @PCollert analysis of 3D/VR scanning platforms of interest. I'm Stuart, sales & marketing co-ordinator at GeoSLAM, based in the UK. @DanSmigrod kindly invited me to join the Forum to answer questions about GeoSLAM's mobile mapping solutions. I'll happily answer any questions anyone has about our products and our company. 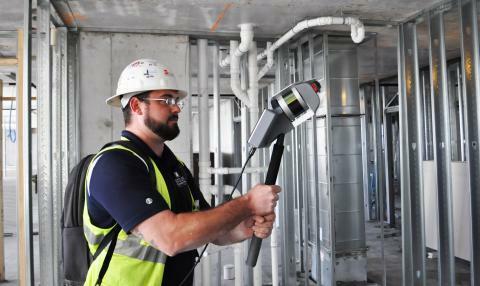 This is an exciting time for GeoSLAM, as we are seeing rapid global expansion, particularly focusing on the US, and greater proliferation of our scanners into new industry sectors, including AEC & BIM. Looking forward to joining in the conversation! Thanks again @DanSmigrod for inviting me to this list. I guess it is my time to big-up the GeoSLAM solution! 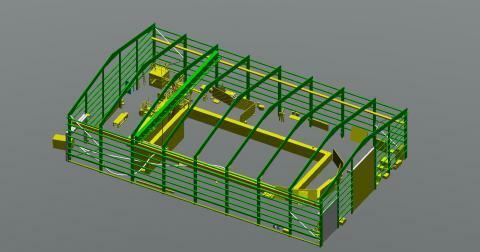 For a large job like this one I would use a ZEB-REVO scanner with the add-on ZEB-CAM. The REVO was launched almost 1 year ago and has been used globally by surveyors, engineers, architects, etc. for easy and rapid indoor scanning. 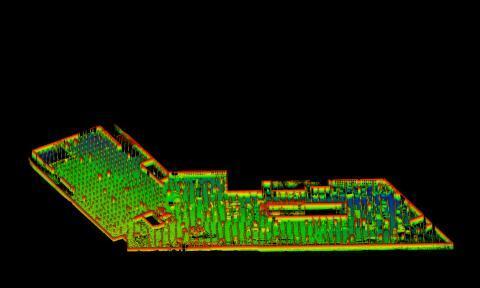 As an example, the image below is of an engineering facility in the UK, it was scanned in around 15mins and processing time was about the same, so a fully registered point cloud in about half an hour. The area of this facility is around 10,000sq/ft. For a larger area such as that quoted, I would break the scan area down into sections, scan separately, and then align the clouds together in point cloud software (CloudCompare is a decent and free solution!). Every expo or event we go to, we always do a scan of the exhibit space and then process on our booth, so large areas are no problem. The ZEB-CAM provides video imagery which is synchronised with the point cloud data, allowing feature identification and reference from image to point cloud. This is processed and viewed in GeoSLAM Desktop processing engine. Hi @stuartcadge, thank you for the presentation. Just one question, because I am not an expert in cloudpoint software and such. Do I get a virtual tour with images using your product? Or is it just something that engineers or architects would use for their professional needs? If the answer is not, then is there any way of combining your files with images so I can get the tour? I received this follow-up info from the Pro that originated this discussion. I've got a response from the client. The scan will be used as a virtual tour for new employees for internal use. I presume that the function that the requested for clicking on a mattertag and a picture of video will pop up is for explanation and education. Dividing the tour into multiple spaces is what I will suggest. With MatterPlus is a bit risky I believe. I would tell the client that the annotation feature (MatterPlus) is in beta and may go away and revert back to the model without the annotation. Knowing this additional info, what would you reply? Since this SUPER-LARGE SCANNING question keeps coming up, what solution would you use to scan a space this large and why? I received this additional follow-up info from the Pro that originated this discussion. Thank you for replying and posting it on the forum. On a Personal note, what would you do in my position? Divide the [space] into, for example, 30 tours with Matterport or choose another System like iGuide? I would not use Matterport for this project: just because you own a screwdriver doesn't mean you should use the screwdriver to hammer nails on a 3-day roofing project. Get the right tool for the job. iGuide Camera System is an example of a tool designed for the scale and scope of the project, as outlined. Plus, the iGuide Camera system includes this We Get Around Special Offer to help you succeed faster. I'll jump in since Paul gave us a shout out. Paracosm's PX-80 is unique because we're the only hand held SLAM system that is able to create a colorized scan. Here's an image of a customer using it a few weeks ago. Private Message me if you have any questions or would like to get some sample data sets. @Gannon, I don´t see how your solution fits what the colleage that started this thread asked for. Or perhaps your video is not good enough to show us the possibilities of your solution. What our colleague asked about was a solution to scann large spaces with photos, pop up videos and tags. In other words, a Matterport like solution but for large properties. Does your system offer somehting like that? 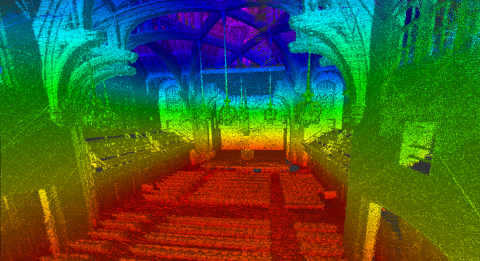 The main output of the scanner is a colored point cloud. We can also make the images available as well (placed in the correct location).